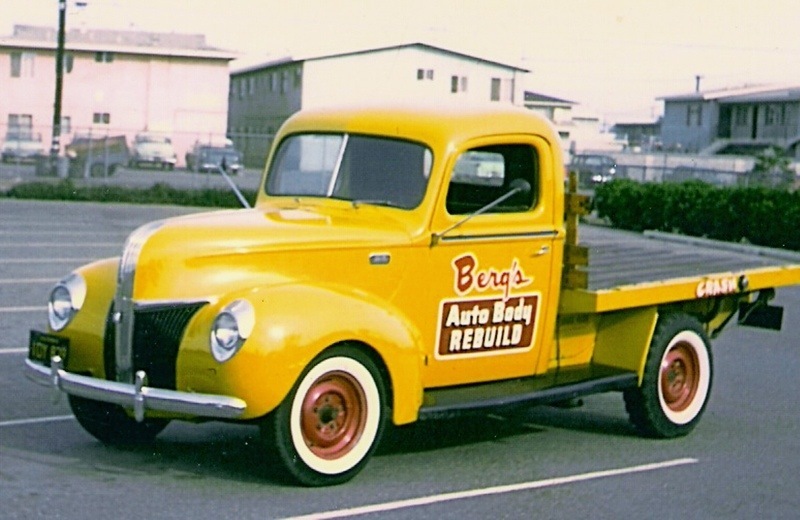 A few weeks ago, after the bendix spring on the starter in my ‘4o Ford stake truck grenaded, I was shopping on the Mac’s Auto Parts web site. I had never visited their customer gallery, but for some reason, this time, I did. That’s when I first saw Jerry Toon’s ’41 Ford stake truck. I had to know more. After doing some digging, I came up with a phone number. I remember thinking, as I was leaving a message on his answering machine, how I am sure that it was a strange thing for him to come home to a guy, over 2000 miles away, calling to talk about his truck. Then the anticipation began. The next afternoon, I received a call from Jerry. He told me the story about his truck, and we talked about other cars. I asked if he’d be interested in sending some pictures, and the rest is history. He and I got busy with other things and obligations in life, but this morning, I finally got the pictures and story that I was looking for. 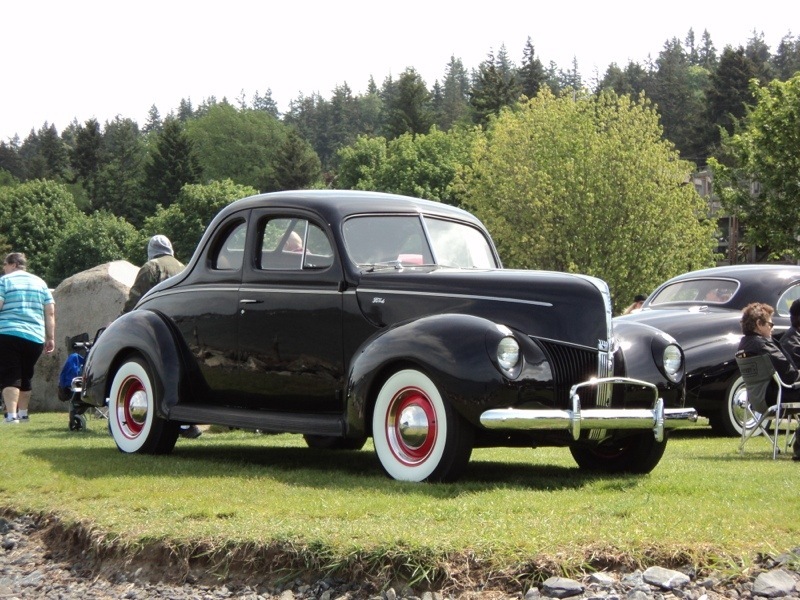 Hi Bret – Finally……..Here are a few shots of the ’41 stake. I have some other photos with the correct painted headlight doors, but will send them later. 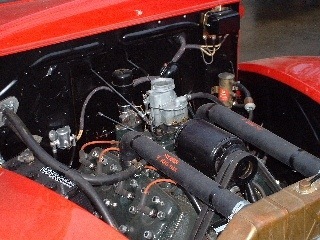 The pics are not in order, and you will note a ’32 five window. 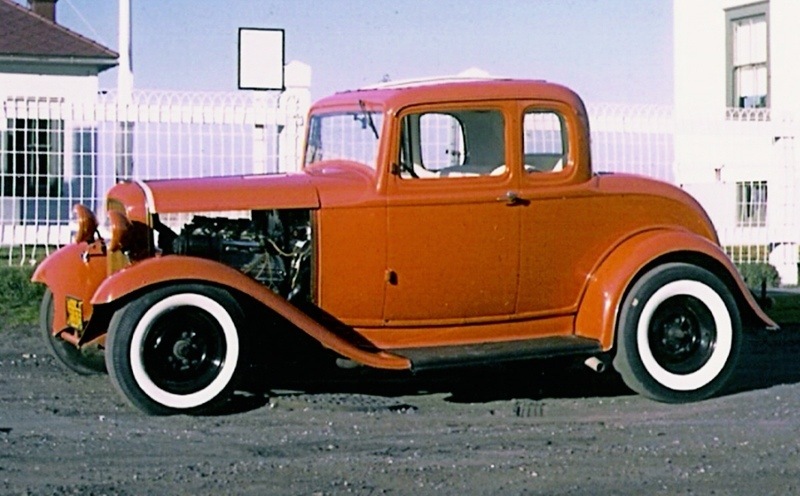 Way back in 1962 I built the ’32 coupe in California and then brought it back to my home town of Everett, Washington. I met a pretty girl in 1963, and needed a more practical ride if I was to be a married man. 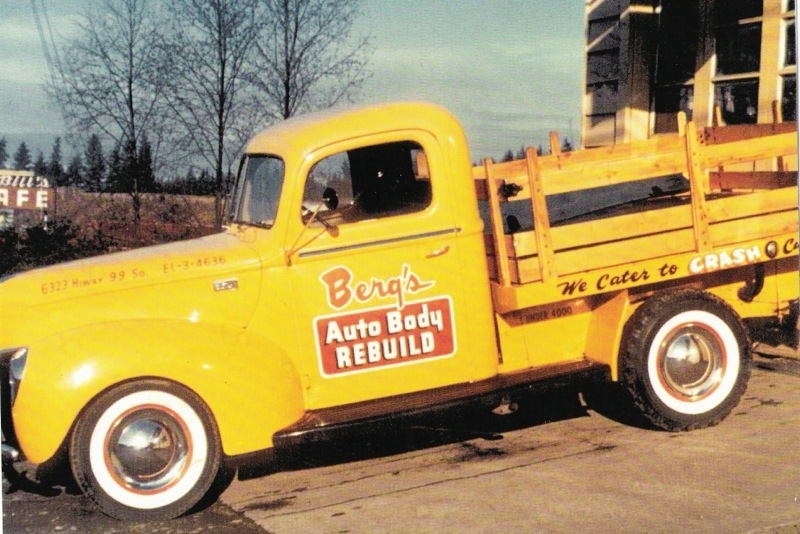 My friend owned Berg’s Auto Body Rebuild, and the ’41 stake was his shop truck. It was practical, and with the Duntov/Corvette engine would do the quarter in the 14’s. That wasn’t too bad for 1963, so I traded my coupe for the truck. 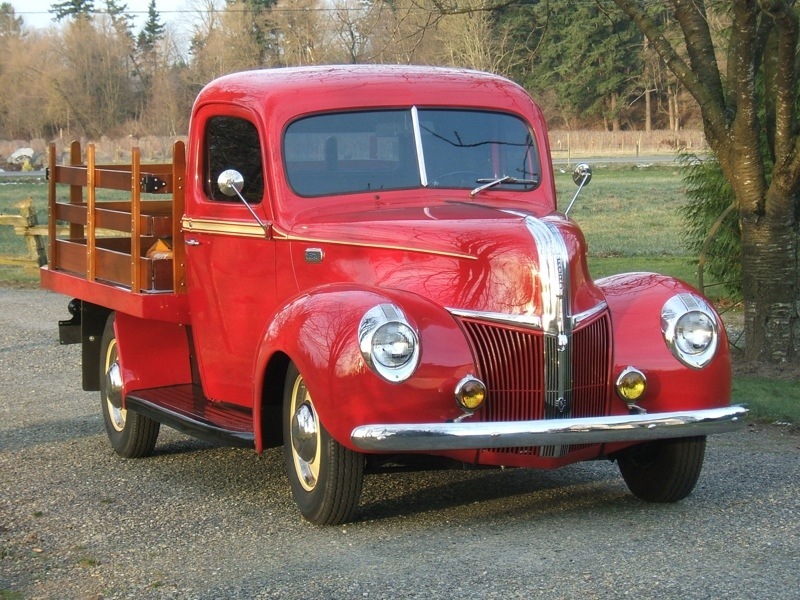 Now you know someone who traded a choice duece coupe for a pickup! It turned out to be a good deal, because I still have the same truck and the same girl! 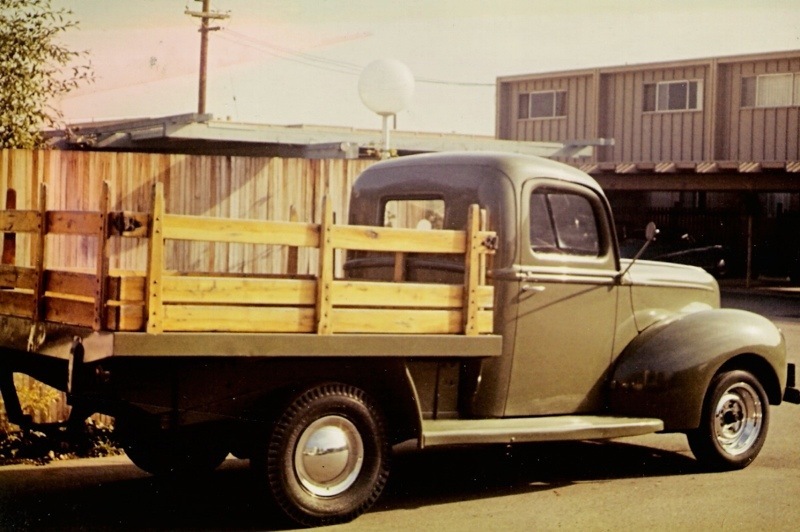 I took the girl and the truck back to Southern California, and in 1965 I painted the truck its original 1941 color, Lochaven Green. I made a big mistake and sold it in 1985, and it wasn’t until 2000 that I was able to buy it back. It came back in pieces. The frame was destroyed, and there was no running gear, but the sheet metal had been stored inside and was still straight with no rust. I found a guy who was building a ’40 coupe with a tube frame, so I grabbed his ’40 chassis, complete with a rebuilt flathead. I hadn’t built a car since the ’60’s. so I had a lot of enjoyment putting this little truck together. 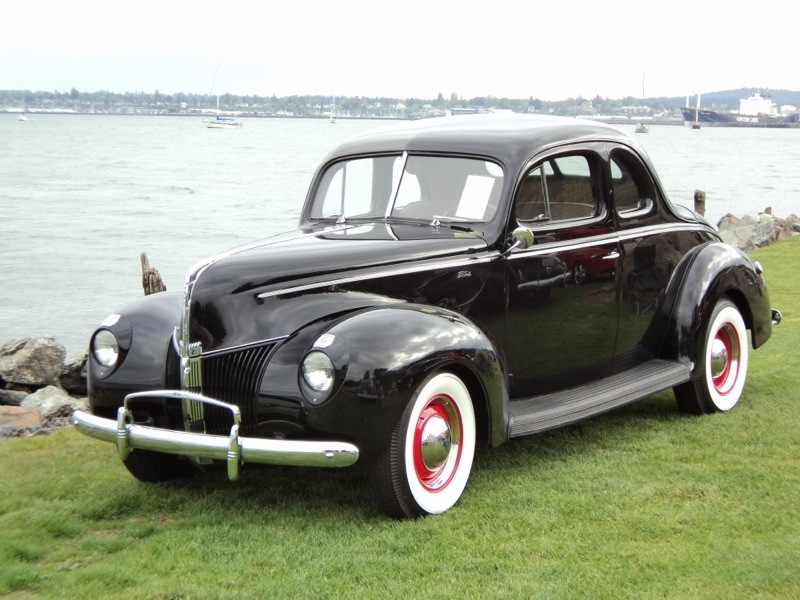 I used to be the painter in my car crowd, so I discovered that I hadn’t completely lost my touch with the 1941 Ford Vermillion Red and Tacoma Cream trim. I was pretty satisfied with the finished product………for a while. A good friend of mine has a nice shop and builds old cars and engines. He came across a Chev 327 long block and knew my truck had been Chev powered. Done deal. We did all the good things with the rebuild and it runs out pretty nice and quick, but it’s not as quick as it used to be. It used to have the Corvette tri-power and the Duntov 404 cam, so I just might tear into it one more time to give it the old time look and the old time sound. Strictly nostalgia. My wife says that I’m easier to get along with when I have my truck and the truck is “not for sale”. 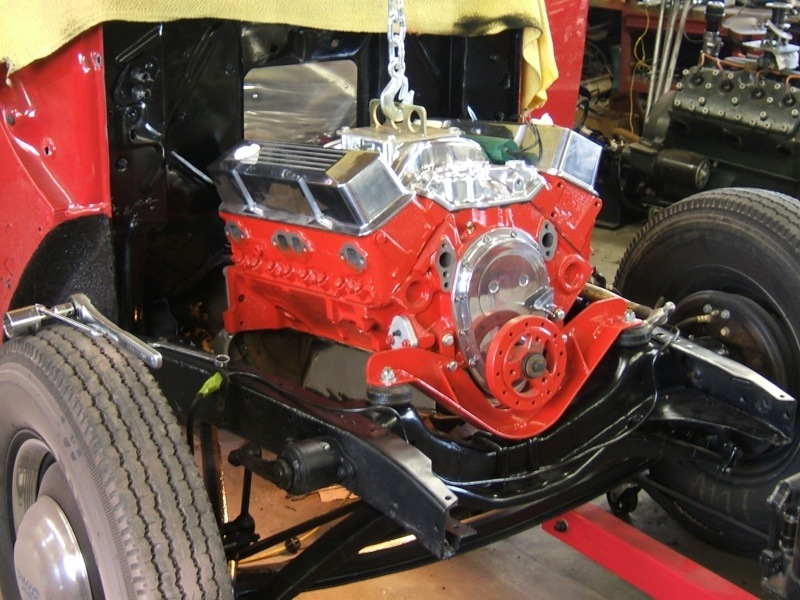 After restoring the ’41 stake, I got the fever again and have built a couple of Mustangs and then the ’40 coupe. Right now I’m looking at a ’66 Mustang 2+2 fastback. If I take it on, something will have to go for lack of space, but it won’t be the little Ford stake truck. I have only seen with my own eyes one other stakebed truck like you and I have. It was a black ’40 in a farmer’s field near Pomona, California. 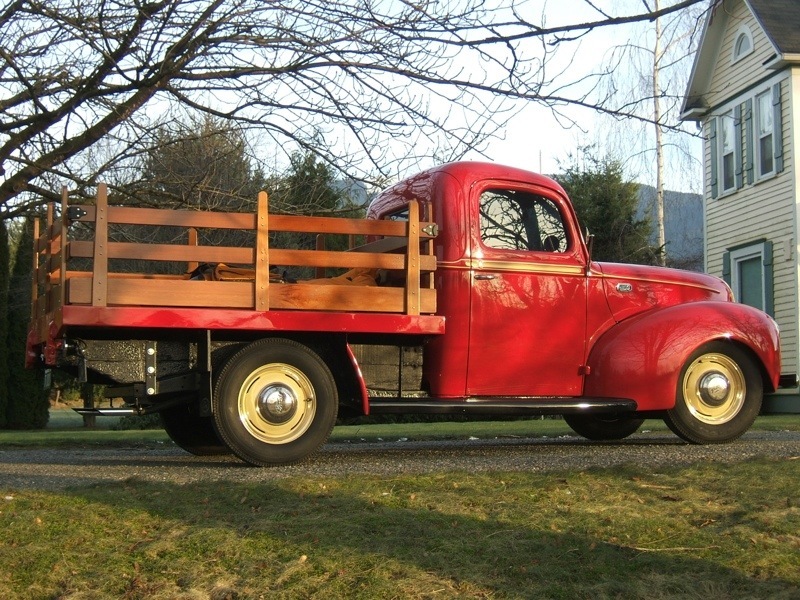 I have a booklet on ’40 and ’41 Ford trucks; “2 Great Trucks” by Howard Towne, and it is the only publication I have run across that addresses restoration of these stake bed trucks. Seeing your choice little stake truck has been really great, so keep me posted and let’s keep in touch………Jerry. Jerry, I appreciate your sharing your pictures and the story to go with them. It’s so cool to see another stake bed, but also even cooler to know your history with your truck.